Subsidence is a natural geologic process that commonly occurs in areas with underlying limestone bedrock and other rock types that are soluble in water. Water passing through naturally occurring fractures dissolves these materials leaving underground voids. Eventually, overburden on top of the voids causes a collapse which can damage structures with low strain tolerances. This collapse can take place slowly over time or quickly in a single event. Karst topography describes a landscape that contains characteristic structures such as sinkholes, linear depressions, and caves. In addition to natural processes, human activity such as water, natural gas, and oil extraction can cause subsidence and sinkhole formations. (FEMA, 1997). There are two common causes of subsidence in Pennsylvania: 1) dissolution of carbonate rock such as limestone or dolomite and 2) mining activity. Common sinkhole locations in Pennsylvania include the Saucon Valley of Lehigh County, the greater Harrisburg metropolitan area in Dauphin and Cumberland Counties, and the Nittany Valley in Blair, Centre, and Clinton Counties. Mining activity is concentrated in the southwestern region of the state, as well as Schuylkill, Northumberland, and Carbon Counties. DCNR provides an online inventory of sinkholes listing 3,619 sinkholes that have been identified across Pennsylvania. Based on geological conditions and current mining activity in Pennsylvania, the annual occurrence of subsidence and sinkhole events in areas of the Commonwealth underlain by carbonate rock or where mining occurs is considered likely, with the precise location of future occurrences difficult to predict given the site-specific conditions that contribute to sinkhole development. Inventoried sinkholes and depressions in Pennsylvania (DCNR, 2016). Example of damage from abrupt sinkhole event. 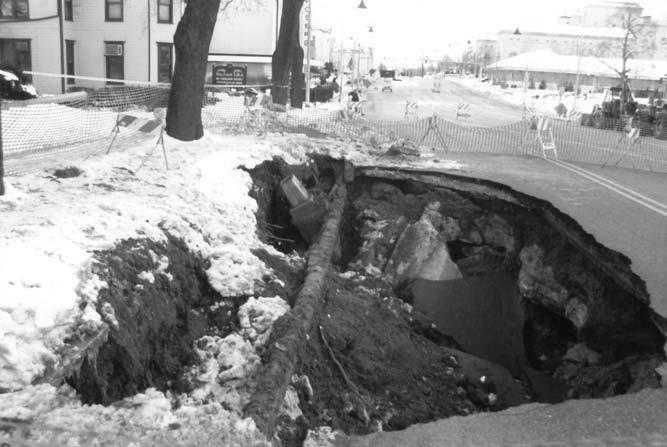 Sinkhole in Dauphin County exposed a utility pipeline (Kochanov, 1999). 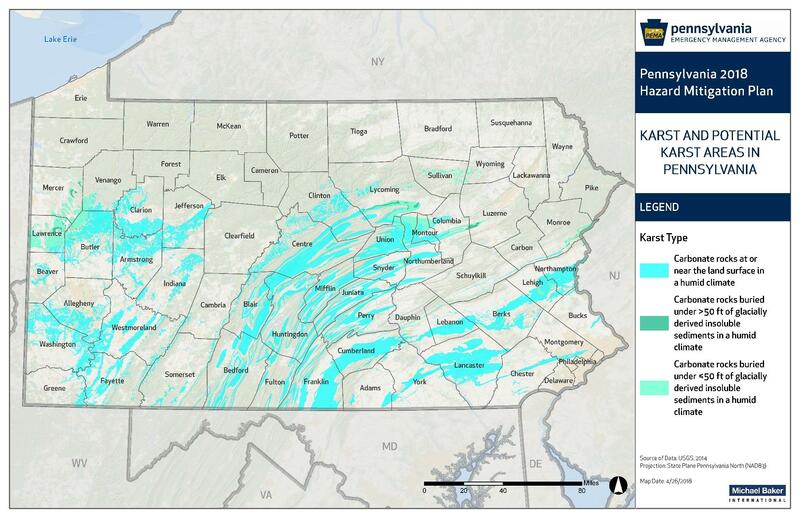 Areas in Pennsylvania with karst or potential for karst development (USGS, 2014).